The hits keep on coming, against Supply Management ("SM") that is. I believe that SM has now decomposed and turned so rotten that it could soon kill Canada as a nation. Fixing SM, or replacing SM soon could help save Canada. Let me explain these shocking statements. I proposed the draft Small Flocker's Plan to replace SM just 4 days ago, to surgically remove the SM parasite from the neck of Canadians. In the 2 days hence, SMI provided me confirming support for the SM problems and the denial of those problems by SM's leadership. Yesterday, I received some feedback from a different person, a SM industry insider and observer of SM and this Blog. They were somewhat reluctant to adding in their two cents. We will refer to this informed Supply Management observer as "SMO". SMO believes SMI and I are correct about the SM Leader's denial of the chronic problems inside SM systems. SMO believes there is significant resistance to change within the SM leadership. SMO believes that any loss of SM protection for Canada's SM markets will immediately drop to the net profit (loss) line of producers and processors. SMO believes that a small drop in sale prices will produce a huge drop in the net profits, probably driving it negative, into loss territory. Remember how GM lost money on every car it made for about a decade, but the financing arm GMAC consistently made money, keeping GM afloat; then all of a sudden in June 2009, it came to an end, and GM was bankrupt. SMO believes that as profits decline, the SM club rules won't be respected. This has been occurring for some time now. 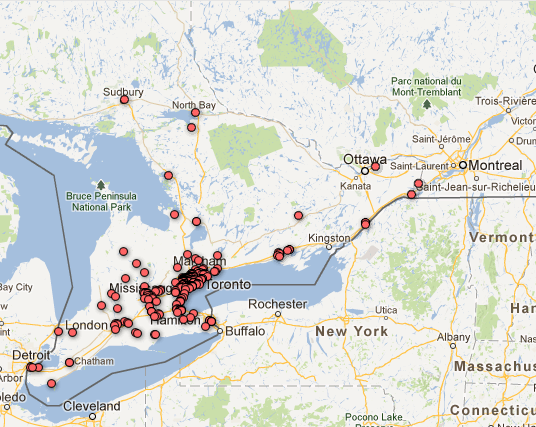 Witness the Magical Trucks of Chicken and the smuggling of chicken into Canada, that I have previously Blogged about. Another sign of the unraveling of SM is the in-fighting at the CFC (Chicken Farmers of Canada) board meetings has been getting worse and worse. Today, CFC board meetings make the Middle East powder keg look like a church picnic. BC's Farm Industry Review Board, in their chronic desperation has recently appealed to the Farm Products Council of Canada to act as a marriage counselor for all the provincial representatives sitting at the CFC Board table. Unfortunately, there are already many other signs of SM's unraveling. "My grandmother had an island when I was a boy. Nothing to boast of, you could walk along it in an hour. But still, it was - it was a paradise for us. One summer, we came for a visit and discovered the whole place had been infested with rats. They'd come on a fishing boat and had gorged themselves on coconut. So how do you get rats off an island, hmm? My grandmother showed me. We buried an oil drum, and hinged the lid. Then we wired coconut to the lid as bait. The rats come for the coconut, and... [imitates metallic scuttering.] They fall into the drum, and after a month, you've trapped all the rats. But what did you do then? Throw the drum into the ocean? Burn it? No. You just leave it. And they begin to get hungry, then one by one... [imitates rat munching sound.] They start eating each other, until there are only two left. The two survivors. And then what - do you kill them? No. You take them, and release them into the trees. Only now, they don't eat coconut anymore. Now they will only eat rat. You have changed their nature." We will soon witness more and more, the SM Rats will begin to feed upon themselves, turning cannibalistic on their fellow SM'ers. SMO also said that eventually some province will break away. Note that Alberta has already given notice that they want out of SM for chicken. Based on the letter referenced above, is BC that far behind? If you're missing a few key provinces in your supposedly national SM system for chicken, is it really all that "national"? As chicken unravels, do you think those events and tactics in chicken will have an impact on the other 4 SM products (ie. dairy, eggs, hatcheries, and turkey)? As these other 4 SM industries reflect back, will that produce a feedback response within the chicken side? SMO suggests that once one province is free from the shackles that attach them to the walls of their SM velvet prison, the pent-up demand and liberating freedom will cause the reformed SM'ers to start ramping up production rates to take advantage of the sales opportunities found in all the remaining SM-provinces. I agree with SMO. I believe the unreformed SM'ers are half asleep, or "fat, dumb, and happy" in their SM-induced drugged state. I also think that the SM-provinces and their Achilles' Heel of low efficiency, high price, and decades of inter-provincial resentment caused and magnified by SM will soon blow up the entire SM system in one quick, catastrophic explosion. When an explosion occurs, a lot of people can get hurt, and it will be the same for an SM system explosion. The time to defuse the SM bomb is now. Who will cut the SM bomb wires before the clock reaches zero and the explosion occurs? Once the explosion occurs, the SM wars will begin. Each SM supplier will seek alliances with other suppliers, or with their friendly producers. Many alliances and factions will quickly form, then dissolve, and reappear in a different configuration. There will be treachery and long knives within the SM ranks. Everybody in SM will get hurt. The consumer will get some short term benefits as prices drop like a stone, and the inventory for sale on store shelves will alternate between feast and famine. However, eventually everybody loses, especially the consumer. Those from outside our province, or from outside Canada, will "come to our rescue", and take advantage of the confusion and the SM Wars. Long term, I'm afraid they won't be any better than our current SM Masters, and will probably be much worse. Soon, this won't be about SM alone, for soon it will be about saving Canada. Most likely, one of the biggest SM Wars will probably be between Ontario and Quebec. It will likely get very nasty. It could get so bad as to be the match that ignites the fuse on the Separatist's movement again, potentially killing Canada. Remember how close it was last time. SM could push Canada over the cliff. I hope the Powers That Be get really worried, really quick; so worried they decide to take action now. I like Canada. I don't want SM stupidity to be its downfall. Beware! The last thing I want are bragging rights to "I told 'ya so!" The best alternative is to take surgical, decisive action now, before any of this doomsday scenario could possibly be set in motion. If you want to raise chicken, you have to feed them. At my farm, I do free range. The girls get let out of the chicken coop most days by 1:00 PM so they can make their appointments as the dust bath beauty parlors all around the coop. When they come out, they are free to grab a fly, worm, or bug to supplement their diet. If you have a chicken factory with an average size flock of 29,000 birds, you don't have that option. If you were silly enough to open a really big door, by the time they all got out of the barn, coffee break would be over, and they'd all have to come right back in again. There wouldn't be time to find a bug, let alone eat it. Almost all of the commercial growers buy their feed from a feed mill, rather than growing and making their own feed. So who do they go to to get chicken feed? You may have seen some very fancy trucks going here, there, and everywhere in Ontario. I understand they carry a lot of chicken feed. Five axle trailer, all aluminum body, aluminum wheels on the tractor, chrome everywhere, with the fancy light accessory package. Nice! How much do you think one of those babies is worth? Obviously, profits are good to be able to afford an entire fleet of these kind of trucks. Could this be a major factor in the high cost of chicken in Canada? Note the previous posting on the mechanism for passing rising feed costs directly to the chicken consumer. This one is owned by Wallenstein Feed & Supply. Wallenstein is a family-owned local feed mill, unlike those big nasty trans-national competitors like Cargill, Nutreco, Ridley, and Viterra. Wallenstein claims to be the #1 feed mill in Ontario for chicken feed, with 25% market share. According to their annual financial report, Animal Nutrition Canada claims 23% of the overall Canadian feed market share. 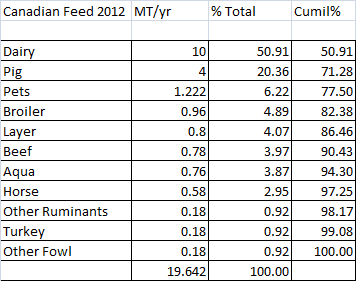 Broiler feed is about 0.96 Million MT/yr for Canada. In 2011, Ontario produced 3333.236 Million kg eviscerated chicken, while Canada produced 1,023 Million kg, so Ontario did 32.57% of the Canadian total. Assuming the FCR is the same across Canada, ON broiler feed consumption is 0.3257 * 0.96 * 10^6= 0.3127 million MT of broiler feed for ON. With a Wallenstein market share of 25% in ON, they would have produced about 78,168 MT of broiler feed in 2011. 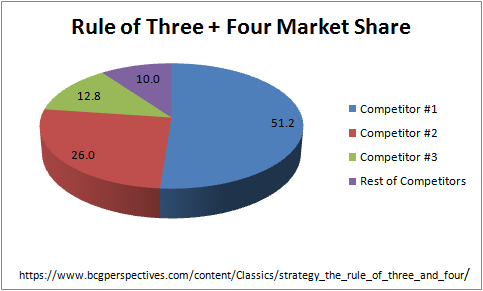 This would predict that the market leader should have a market share of 51.2%, not the 25% that Wallenstein currently claims. Why the difference? The Rule of Three and Four applies to stable, competitive markets. It generally does not predict when these two pre-conditions do not exist. There is a huge consolidation going on around the world. Most feed companies are using every dollar of profit, and every dollar they can borrow to buy their competitors. One example is Parrish & Heimbecker (P+H) with head office in Cambridge, with 11 sites across Canada, who has been on a buying spree as well. I would suggest that the mergers and acquisitions will continue at an ever increasing pace until the 51% is achieved or exceeded. It will only be stopped when Canada's Competition Bureau steps in to stop it from further consolidation until there is just one feed gorilla left who owns all of the market. Supply Management monopoly attracts the formation of surrounding monopolies, the feed mills being one of them. I'm taking bets as to whether the winner will be Wallenstein, P+H, Cargill, or a foreign invader. Place your bets. Will Wallenstein eat its competitors? Will a competitor eat Wallenstein? It's only a matter of time, as the sharks circle their victims. As Chris Hedges says, you can take a step toward supporting truth and justice, or you can take a step towards privilege and power. Doing one of these automatically undoes the other. Choose your path. This is similar to the polarization of "You're either with us, or against us." I received an email providing me feedback on my proposed replacement for Canada's Supply Management System . The email was from a Supply Management insider ("SMI"), a well informed, influential insider to Supply Management, a close advisor to those with their hands on SM's levers of power. So as to protect this person from outing and subsequent ridicule, I will not name them, thereby encouraging others like them to come forward with their comments & suggestions. SMI suggested to me that SM could be improved, needs to be improved, but radical change of SM need not occur. SMI feels that abandoning SM for anarchy, or nihilism, or some ill-defined alternative need not occur. SMI likes very much the 4 Principles I proposed for any solution to the current SM system. SMI seems to feel that it is a virtue that Canada's SM system is able to charge 300% for its SM commodities. SMI feels that as current trade talks continue, we will probably be forced to open our borders some more to foreign goods (ie. the SM commodities of dairy, eggs, chicken, and turkeys), and our high domestic prices may have to drop somewhat, but SMI sees this as no reason to throw the SM baby out with the bathwater. SMI feels it is highly unlikely that Canada will be forced to fully open its markets to foreign goods and totally dismantle our SM system. The nuance I sense is that SMI feels that the winds of change against SM are mainly from outside of Canada, and most people within Canada are oblivious or apathetic towards SM and what it does for us (does to us). It's almost as if SMI feels that SM is similar to maple syrup and hockey, that SM is one of the important factors of what makes us Canadian. SMI seems to feel my proposal will upset the leaders of SM, cause them to feel threatened, and therefore cause them to fight against it, rather than support it. SMI said, "...the SM boards themselves need to be convinced that ... their situation is untenable." Quote by Upton Sinclair (1878 - 1968), prolific American writer, including The Jungle (1906), which exposed scandalous conditions in the U.S. meat packing industry, causing a public uproar that contributed in part to the passage a few months later of the 1906 Pure Food and Drug Act and the Meat Inspection Act. Time magazine called him "a man with every gift except humor and silence." SMI also said, "Internally I think they see big problems in how the mechanics of the system is operating, but do not see a need to wind the system down. Any proposal for big changes in supply management will need the SM groups' buy-in; they are stuck in marginal changes when they should be making big changes, but I don't see why they would support a process for wind down." I agree with SMI, that the SM leaders can barely bring themselves to contemplate incremental, marginal changes. SMI suggests that I focus my efforts on helping SM to: a) become a little more liberal; b) lower their domestic commodity prices just a little (or slow the rate of cost increases ?? ); and c) obtain growth in the industry. As a management consultant for the last 23 years, I always told my clients, "As bad as it looks today, 95% of what you were doing is good stuff. It's that last 5% is what is driving you crazy and causing all of your issues. We need to focus our efforts there." When I got started on SM in Jan. 2012, that is what I assumed would apply here as well. Since then, I'm beginning to see just how bad it is. Total $11.9 Billion per year taken out of Canadian's pocketbook every year. I hear similar issues on the dairy side. Witness the pizza pack fiasco on cheese. Turkey is pretty quiet. Can we assume all is OK over there? Those who are channeling and directing this SM system, and simultaneously benefiting from it, will they voluntarily stop? I seriously doubt it. They now have 2+ generations fully steeped into their traditions and myopic view of the world, similar to how most psychopaths see their victims; they just don't see a problem with what they are doing. They think they're doing "god's work", and we should all be thankful for their tireless effort on our behalf. Unfortunately, we don't have Diogenes to help us find the one honest man in the SM system. I'm sure all of these SM bureaucracies, [ reference to SMI's organization], you, and many others have good people who are trying to do a good job for the "system" they work for. While they work for the system, they didn't create it, they just accept it as somebody else's decision that they are carrying out the best they can. In other words, careerism. It's good for their career to bolster the current SM system as much as they can, because the alternative is frightening. Those in control of SM will not stop on their own. We, the Canadian public, can either accept our fate, to continue to be subjected to their whim to do with us as they please, or they have to be stopped against their will. Like any psychopath worth their salt, they will do everything in their power to retain dominance and control over their historic powers, privileges, freedoms, and their victims. All that above sounds like a manifesto. I never thought I'd get that black & white about something. Unfortunately, I see no other choice with these people. If all the above is true, or just 1% true, I don't see a graceful evolution, or a few minor fixes around the edges. SM may have worked & was needed at some time in the past, but is rotten to the core today, and the cancer needs to be removed. If I'm missing something, if there is some glimmer of hope in this pile of smoking ruins called SM, please point it out to me. I've Blog posted on our draft plan for the removal of Supply Management from Canada. That plan allows everybody to agree on the farm-gate price to be paid for chicken (or the other SM commodities of eggs, chicks, turkeys, & milk). However, there is a geographical separation between the producers and the processors. Somehow, we have to arrange for the transportation between the two parties. The truncated k-double auction can match up a specific producer with a specific processor, but based on the randomness of the auction process and the resulting bid-ask matching, that matching could cause unrealistic shipping of chicken everywhere across the province. It is therefore best for the auction process to be supplemented by a least-cost shipping schedule. How do we do that transportation, and who pays for it? Obviously, it is better to minimize shipping costs (sorry truckers). Once a producer or processor are geographically located, it cannot be easily moved, yet things change. Populations shift, vehicle fuel prices go up & down, producers & processors get into disputes that force them to deal with others than the geographically closest match, and so on. If somebody decides to grow chicken in Thunder Bay, how do we (should we) be shipping those chickens to a processing plant in Toronto? We do separate auctions for each region. This complicates the auction process greatly. 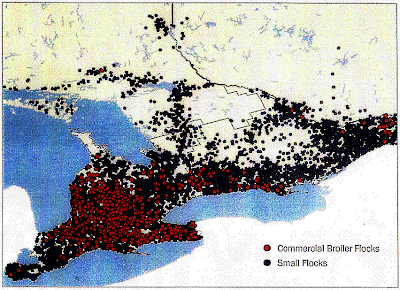 It may cause the balkanization of the provincial chicken market (ie. sub-division, non-cooperation, competition, abandonment). Some auctions may get shunned by important producers or processors. There may be large price differentials between the different auctions, putting one side at a significant competitive dis-advantage. Popular auctions are over-loaded while unpopular auctions are under-serviced. We leave those transportation details for each producer-processor pair to work out for themselves. The auction sets the price for the chicken, transportation extra. This might work most of the time, but it will probably be like musical chairs when the music stops; a mad scramble to grab the nearest chair, somebody gets hurt, or you've left standing and the nearest empty chair is at the far end of the room. Not nice when you have to do this every quota period, and your life depends upon you making it there before somebody else. We have FOB shipping hubs defined all across the Province. The producer includes the cost of getting his product to the nearest FOB shipping hub in their auction bid, the processor pays to transport from their nearest FOB shipping hub to their factory and includes that price in their auction bid, then the bookkeeping cost of inter-hub transfers is pooled and shared equally by all. I wouldn't want to be the one who decides how many and where these FOB shipping hubs will be located, for nobody will be happy with the decisions made. The shipping costs are pooled for the entire province. The shipping costs are pooled for each of the regions within the province. Dijkstra's Algorithm is the standard algorithm that is used to find the shortest path between two points (eg. GPS mapping and driving directions). When we have multiple sources and multiple destinations, it's a little more complex. Good thing IBM has already solved that problem, way back in 1996. They used a modified A* heuristic algorithm to estimate the Dijkstra optimum path in 30% less computational time. There is also the Floyd-Warshall Algorithm. Neither of these is exactly what we will need to solve the Multiple Pairs Shortest Path Algorithm ("MPSPA") that we will require for provincially-optimum chicken shipments, so some computer software development work will have to be done on this issue. Once the auction results are defined, the winners' names & locations will be entered into this MPSPA shipping optimization software, and it will calculate the province-wide optimum pairing up of buyers & sellers; defining which supplier gets to ship to which processor. Each of the parties are then notified of who bought & sold for each bid-ask pair. If there are specific classes of chicken sold, then multiple runs of MPSPA, one for of the various classes of chicken, will have to be calculated. While this gets us a province-wide optimum shipping schedule, the cost of shipment is still significant, as well as the scheduling of the catching crews. Do we need to have all producers and all processors treated the same, no matter where they are located in the province, removing geography from the equation? For example, let's say a producer is right next door to a chicken processing plant, and these two love each other, and have been supplier-customer forever. Perhaps, for the good of the overall optimum on a provincial basis, it is better to break up these kindred spirits, and they will be required to buy and sell to somebody else who is a little farther away, and somewhat of a stranger. This will cause some frustrations & higher costs for both of the original pair. If we wish to get a provincial minimum cost, shouldn't the minimum cost be pooled across the province, so these two chicken lovebird don't personally pay more for the good of everybody in the province? I therefore recommend that shipping costs be minimized on a provincial basis using MPSPA, then the shipping costs are pooled across all of the province, and added as a $/kg cost to all chicken transactions. This makes all farms and all processors on an equal footing cost-wise, no matter where they are located in the province. In a previous posting, I proposed 4 Principles for ensuring that we can get out of our current SM frying pan, without falling into the fires of hell. For those who don't fully understand how SM (Supply Management) quota system works (I include myself in that category), there are two sides to every quota. There is a Producer Quota for the farmer to produce the commodity (ie. milk, eggs, hatchery chicks, turkeys, and chicken), and a separate Processing Quota for those interested in buying the commodities produced (ie. the processors, distributors, and retail sellers of those commodities). The farmers, who produce under the Production Quota, need steady customers, and to get enough for their production to earn a fair living. The buyers, who buy the produced commodities under their Processing Quota of the commodities need a steady supply of quality products at a reasonable price. Legislation is passed, both federally and provincially, or on a stand-alone basis by one or more sane and brave provinces willing to go it alone. The date that the legislation passes is called "D-Day". The SM production and processing quotas as they existed on D-Day will be defined as "Base Quota". From D-Day to D-Day plus 1 year, the new systems described below will be built and tested, to ensure they are ready for their launch as of D-Day plus 1 year. Some vertically integrated supply chains exist (ie. same or related companies own the hatchery, the grower, the slaughter plant, and may have a long term contract with a major grocery chain). There may also be some producers and processors who are best of buds, know exactly what the other one wants and consistently delivers it at a fair price. All of these should be able to opt-out of the supply management system as of D-Day + 1 year, except for the maximum quota production that they are authorized to produce. As the SM system slowly disappears and the new system come into play, they will have to deal on the new system to retain, add, or subtract the amount of chicken they will produce, same as all other quota holders, as quota becomes extinct. As of D-Day plus 1 year, there will be no more supplemental quota given to the current SM producers and processors. If there is a contraction of SM market needs after D-Day, those holding Base Quota will all be reduced on a shared-pain basis, reducing their Base Quota for production and/or processing levels similar to the mechanism in the current SM system. As of D-Day plus 1 year, any supplemental production and processing quantities needed to serve domestic markets beyond the Base Quota will be auctioned off to the highest bidder. This new supplemental quota will be limited in quantity, but has no minimum Cost of Production ("COP") associated with it, and a sub-set of current SM rules (the minimum rules necessary to achieve fairness and stability), and the resulting SM products (ie. milk, eggs, hatchery, chicken, turkey) are sold on the open market to those who choose to buy it, or sold through the Canada Commodity Auction system. From D-Day to D-Day plus 1 year, a Canada Commodity Auction system will be designed, tested, and made ready for launching on D-Day plus 1 year. It will be a standardized commodity auction system for all of Canada, but each commodity in each province will be done separately (ie. 10 provinces times 5 commodities= 50 separate auctions done each quota period), plus the special auctions described herein. If there are specialty grades within a commodity (eg. free range organic chicken vs. regular factory chicken), then this can be a separate auction as well. So as to minimize the auction sale prices, the auction will use a truncated k-double auction (see here and here), similar to that proposed for the Quebec Egg Marketing Board quota. Initially, just the holders of SM Base Quota will be allowed to participate in these commodity auctions. For a commodity auction for producer and processors, the participants (both producers and processors) will submit their bid for the quantity of the commodity (eg. kg of chicken) they are interested in, and the price they are bidding at (eg. $/kg). The maximum quantity that can be entered as a bid will be the "proven capacity" of that producer or processor, based on historical proven capabilities or recent changes to their processes; all which will have to be carefully defined and managed so as to minimize strategic bidding and other gamesmanship that would disrupt the auction. Everybody who submits a bid or ask will pay/receive the same price if cleared (ie. cleared is when a bid or ask is accepted by a counter-party, and it closes successfully). With this same clearing price for every successful party in the auction, for somebody who was willing to pay a lot more than the strike price, they end up getting it cheaper than they hoped for (Yea!). If someone bid too low, their bid won't be accepted as it was below the strike price that everybody enjoys, so no deal, better luck next time. If someone was asking for a low price, they may end up getting a lot more $ than what they had asked for (Yea!). If they asked for too high a price, their asking may be above the strike price, and they won't be selling their commodity during this auction, so no deal, better luck next time. This system minimizes the need for guessing what everybody else is bidding (ie. avoids strategic bidding). I suggest there will be multiple auctions for each quota period. This enables producers and processors to make a recovery play if their bid was way off in the previous round. There can be a problem with multiple auctions. If everybody plays nicely, there won't be a problem, they just re-set their bids (if they so choose), and they can get their commodity bought or sold in the next round. However, some people may think they have the other side over a barrel. For example, a producer might figure than he can leave his chicken barn empty if he has to, but thinks that the processing plant absolutely MUST have a supply of chicken, so the producer significantly jacks up his asking price for a second round of auctions, trying to price gouge the processor. If this was allowed to occur, it would tend to polarize the remaining bids to the extremes of the pole (ie. all bid are too low, all asks are too high, no sales will occur, everybody gets upset), rather than bringing buyers and sellers together in a reasonable manner. I therefore suggest that the first auction is only for those producers and processors within their home district. If you are not located in that District (buyer or seller alike), you cannot put in an offer for Auction #1. 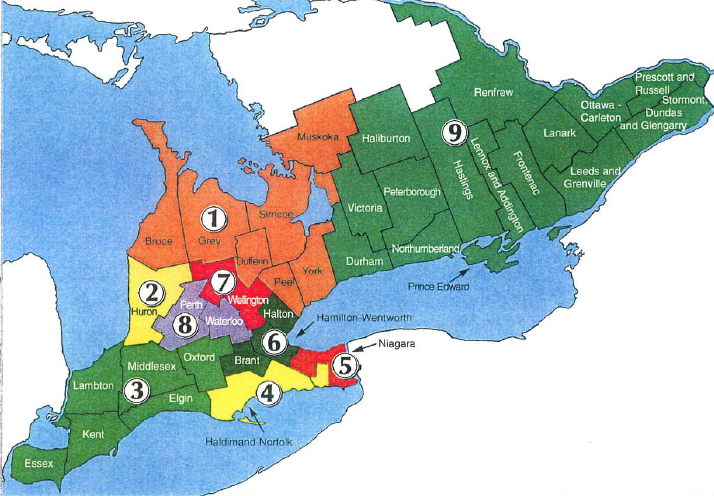 For Chicken Farmers of Ontario, there are 9 Districts, and each producer and processor would submit their bid/ask to the auction for their home district. If they were not totally successful in buying/selling all that they needed, they would have a second chance in the province-wide auction, Auction #2. With more players who can participate in Auction #2, if they wish to play games with their bids, they will most likely be left sitting on the sidelines with no transactions in the next quota period. Auction #3 can be held for those who still want to sell/buy, adding in additional buyers/sellers from other province within Canada (ie. inter-provincial bids and asks). Auction #4, the final auction for each production period can be held for those who still want to buy/sell that would include local, provincial, inter-provincial as well as foreign bidders. For transportation purposes, all winning bids/asks will be matched as to which producer will ship to which processor, so as to minimize transportation costs. It matters not that the strike prices of the one shipping and the one receiving that shipment do not match, as there is a match somewhere in the auction system. This auction system will give preference to domestic production, if the buyers & sellers so choose. If the local suppliers or producers become arrogant, and become bad actors, the other side will skip that auction and go to the next. If somebody delivers sub-standard product, there will be a complaint mechanism, the shipment will be inspected, and if the defect is verified, damages and fines will be assessed. In the end, the customer gets what they want. Some commodities are done in batches (eg. broilers, turkeys). Other SM-commodities have a semi-continuous flow (eg. milk, table eggs) for 1 to 3 years which is the animals natural lifecycle, which cannot be easily shut off and re-started. This could cause a market bargaining power imbalance between producers and processors (ie. producers MUST sell, as the product keeps coming, whether or not a willing buyer and an affordable price can be negotiated). As compared to a dairy farmer, a milk plant can more easily clean out the plant, lay everybody off, and wait for better milk prices, or better auction results. The farmer isn't so lucky. To make each side have more equal bargaining power, it is suggested that long term "take-or-pay" contracts could be auctioned for each commodity and grade, for example a 1 to 5 year production quantity, auctioned well in advance of the start of the start of delivery. Upon winning a reasonable auction for his milk, the farmer knows his budget and cash flow, and has time to grow his own or buy a good producer for his herd, and move one or more of his cull cows to the Hamburger Department. When that long term contract is close to expiry, the farmer can decide to retire that cow, or continue milking her and sell her milk on the more lucrative spot market (ie. month by month). This auction system used to sell the commodities (ie. eggs, milk, chicken, turkey, pullets), can be similar for selling the remaining quota for those commodities (ie. farmer retiring & wants to sell his quota). Beginning on D-Day plus 1 year, Canada Quota Auctions will be held on a regular basis via Internet system with maximum openness, transparency, disclosure, and accountability. The strike price will be determined by the bids and asks from SM quota holders and from non-SM quota holders (if any are in the auction). Once each auction is completed, the holders of SM Base Quota who participated in the auction will be offered to purchase this supplemental quota on a right of first refusal basis at the price of the winning auction bid, starting at the person who bid the lowest amount but still above the strike price, continuing up the list of bidders until all the supplemental quota has been sold (ie. the truncated basis of quota assignment). Once non-SM Base Quota holders are allowed to enter the auctions (see Step #13 below), then if the holders of SM Base Quota don't buy all of the supplemental quota at the auction's winning bid price, then non-SM Base Quota holders are allowed to purchase the remaining supplemental quota, starting at the person with the lowest auction bid that was still above the strike price, going up the list until all the supplemental quota has been taken up. For the period from D-Day plus 2 years to D-Day plus 10 years, Canada Commodity Auctions will hold a special auction where 10% per year of the then-current SM Base Quota and non-SM supplemental quota can be removed from the Canada Commodity Auctions monopoly for trading on alternative systems (ie. competing auctions, private deals, vertical integrations, etc.). All producer and processor SM Base Quota and supplemental non-SM quota must trade through Canada Commodity Auctions unless it has been removed from this mandatory system through the auction method described here. This special auction will continue each year until the Canada Commodity Auction is defunct from lack of customers who wish to use their service, or they have proven their worth to the industry (ie. less and less monopoly, more and more voluntary participants assuming the Canada Commodity Auction remains a better system than the alternative systems that have sprouted up, if any). This step helps ensure stability during the transition period, minimizing the damage to Canada and consumers caused by half-baked ideas by the various SM participants. Starting from D-Day plus 5 years, the SM Base Quota for each commodity (ie. milk, eggs, chicken, turkey, hatchery) will be reduced by 1% on a Canada-wide basis, and that 1% will be added to the Canada Quota Auction system for sale to the highest bidder. On D-Day plus 6 years, an additional 5% of SM Base Quota will be removed from total outstanding SM Base Quota, and transferred to the Canada Quota Auction system. Similarly, between D-Day plus 7 years and D-Day plus 10 years, each year thereafter 10%, 20%, 30%, and 34% will be extinguished from SM Base Quota and transferred to the Canada Quota Auction system, until all SM Base Quota is fully extinguished by D-Day plus 10 years. As Base Quota is reduced, there may be dynamic surging or fluctuations due to multiple players simultaneously adjusting their business response to the publicly viewed stimulus seen by all. In this case, a mechanism is required to dampen or eliminate these oscillations. It is suggested we need a mechanism to efficiently allocate the available demand to those who value it the most. Ausubel's Efficient Ascending Bid for Multiple Objects is recommended for consideration. Between D-Day and D-Day plus 10 years, any holder of SM Base Quota can choose at any time to: a) sell their SM Base Quota privately to others who already own SM Base Quota; or b) Sell their SM Base Quota to someone who currently doesn't own any SM Base Quota; or c) After D-Day plus 1 year, sell their SM Base Quota via a special auction using the Canada Quota Auction system. As of D-Day plus 5 years, new industry entrants who do not own SM Base Quota can begin to participate in the Canada Commodity Auction system, bidding for either Production quota or Producer quota, or both. For the one year period after D-Day plus 5 years, the number of new entrants will be restricted to just 10% of the number of holders of SM Base Quota as of D-Day plus 5 years, calculated separately for both Producers and Processors SM Base quotas. Note that they are buying something that is disappearing over the next 5 years, so bid accordingly. Each subsequent year from D-Day plus 6 years to D-Day plus 10 years, the maximum number of new entrants will be increased by another 20% of the then current number of authorized participants in the Canada Commodity Auction. This limitation on new entrants and their slow addition will continue until the stability of the then-current SM system and the then-current Canada Commodity Auction system is demonstrated, or 100% of all applying entrants are immediately accepted. There may be more applications for being a new entrant than the spots currently permitted to participate, so this will be assigned by a separate auction to the winning bidders under the Canada Commodity Auction system. As of D-Day plus 10 years, the current Supply Management system in Canada will have been totally dismantled, replaced by a free market system. From D-Day to D-Day plus 10, all governments and industry groups will be encouraged to provide adequate training, loans, bridge financing, counseling, research, communication systems, forums, websites, disclosures, newsletters, user focus groups, reports, audits, and other facilitation, support, and management assistance to ensure a smooth transition. Canada's Competition Bureau will be ordered to be on high alert, watching for unfair trade practices. especially between the debate on the draft legislation (ie. prior to D-Day), up until D-Day plus 10 year transition period, and beyond. It will probably help for the Competition Bureau to do a Canada-wide roadshow to all those within the current SM system, starting as of D-Day, focusing their communication efforts with the public, plus all suppliers to SM (ie. equipment, feed, drugs, services, etc. ), plus all customers of SM producers and SM processors, so that the rules are made very clear, that there will be a zero tolerance for nasty behaviour in the marketplace, and swift punishment for those who wish to test the resolve of the Competition Bureau, and the Competition Tribunal. After D-Day plus 5 years, imports of commodities into Canada will start to be slowly lifted, and import tariffs reduced, so that at D-Day plus 10 years, they are fully removed and Canada has joined with the rest of the world in full free markets on these commodities. After D-Day plus 5 years, foreign entities can apply to participate into the Canada Commodity Auctions. Hopefully this will quickly help Canada to go from last place in OECD exporting on these commodities (1.4% market share today) to first place (about 50% market share, the maximum sustainable share we could achieve). This alone can increase Canada's SM-5 production capacity to 5 times or more, as compared to what is currently done domestically in Canada. That could be a huge driving force for Canada's GDP. Today, agri-foods in Canada are just 8% of our GDP and hire 2.1 million people. If this plan truly works, these 5 SM commodities can grow by a factor of 5 or more, so Canada's GDP would increase by 32%, or 5.7% per year for 5 years. Not even China gets that kind of growth. What are we waiting for? So that's it, 17 "simple" steps to get us out of SM purgatory. Show me and the world through objective facts and reasoning why this proposal won't work, then propose a solution to the problem you identified. If you want to get emotional about this draft proposal without facts, I'll listen, and I hope it makes you feel better, but that doesn't help find a solution. If you wish to pontificate and make bald assertions, with neither facts nor explanations as to why and how this draft plan will work or won't work, that doesn't help much either. Identify a risk that isn't adequately handled; that's helpful. Discover how some idiot could screw everything up by doing "X", and find where a gaping hole in the draft system exists that won't prevent or protect us, that's also helpful. I'll keep modifying this draft until everybody is happy. Then we can start implementation. Current Version: Rev. 2 Posted 2013/06/05 21:30 hrs. When I speak of “SM”, I mean Supply Management, not sadomasochism, but I fully understand how people readily confuse these two subjects, as they are so similar. 4. Find a method to keep yourself out of all future holes. I therefore wish to define these steps for how we can escape from our SM tomb. We need to get out of our SM frying pan, without falling into the fires of hell. I’m not totally happy with my proposed solution as of yet. I need help to point out the potential problems in what I’m proposing. That’s where you come in. Twenty experienced people poking at the obvious holes in my rough plan would be more effective than a thousand office-bound bureaucrats drafting regulations. 1. Protect the public and the current industry from shortages, excess production, excess investment, obsolescence, shocks, chaos, and wild swings in risk, production, quality, price, and all similar measurements; thereby ensuring a smooth transition to the new reality. 2. Protect as much as possible the investments already made in infrastructure (eg. farms, barns, equipment, office bureaucracies, policies, procedures, training manuals, etc.) so that they continue to be useful and effective for current owners & users, and all future owners & users. 3. Develop measurements, then measure and communicate them in a honest, accurate, unbiased, objective, useful, and timely manner. This enables us to minimize the risk, judge our progress, verify the capabilities and stability of the system, show the costs and benefits of the changes made, and encourage us towards our better, future system. 4. While respecting the first three principles, and continuously maintaining flexibility on how best to achieve the long term goal, continue to drive the transformation forward in spite of short-term frustration, fears, finances, and friends in high places. Stay the course, or find a better course to our better future. If we are all in agreement on these needs and principles, then I’m ready to share with you the small seed of an idea that I think will help us transition into a brave new world, leaving behind our Sado-Masochistic Supply Management system behind, henceforth to be referred to in all history books as SM-SM or (SM)2. If the above principles are ambiguous or lacking in any way, please give me your ideas so that I can improve them. If my ideas are weak or incomplete, you can help make them stronger and better. If they are dangerous or unworkable, then the sooner we discover this, the better. Bad ideas need to be identified as such, so that they can be removed from further consideration, and make way for better ideas. If you agree, please say so. If you disagree, please pose a better idea. I need your help. 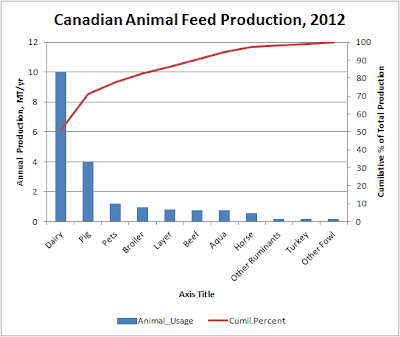 A total of 19.642 Million metric tonnes of animal feed were produced in Canada in 2012. The Dairy industry is the biggest consumer of compounded feeds, approximately 50% of the total feed tonnage. Broilers are 4.9%, layers are 4.1%, so together the chicken fed consumption is 9.0% of the total feed consumed in Canada. The animal feed industry in Canada is going through many changes. Mergers and acquisitions are the name of the game today. Animal Nutrition Canada claims to have the largest share of the feed production market, 23% of the Canadian total. They sell under the brands Shurgain, Landmark, Nutreco, Mapleleaf. I understand that Wallenstein is one of the largest chicken feed suppliers in Canada, but have been unable to confirm this as of yet. Typical feed cost for chickens is about $384 per metric tonnes ("MT"). As calculated previously on this Blog, if chicken feed has increased by 60% during the same period that cat & dog food increased 20%, that means that there is an excess charge for chicken feed of $96/MT. 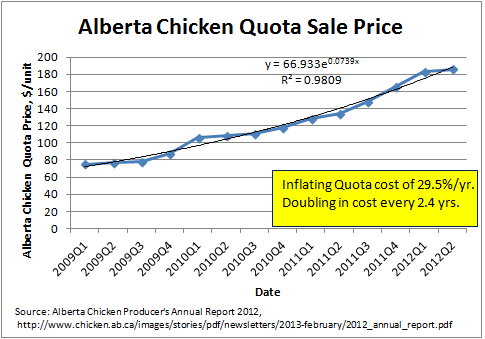 With poultry eating a total of 2.12 Million MT per year, that is a total gouging of $203.52 Million per year. The farmers gladly pass those excess costs onto their suppliers, who mark it up further as it works its way down to the lowly consumer. Assuming 40% markup at the producers level, and another 40% at the wholesale/distribution level, the gouging approaches a total of $398.9 Million per year. Poor consumer. When will we get relief from all of this economic sludge being poured down our throats? PGC might thank their fortunes that I didn't find out about their application until the public commenting deadline had closed. At this point, we have to hope that FPCC does the right thing, or somebody who is attending the Winnipeg public hearing finds these notes and submits one or more of them into the public record. So here goes. Does PGC have answers for any of these? Why can the PGC Board arbitrarily decide that somebody raising pullets can't be a member of PGC, according to PGC's current Bylaws? To me, this seems ready for abuse and unfair use. Why can somebody who is currently a PGC member be voted out on a 2/3rd majority? Now, when PGC is a voluntary club, this power doesn't mean much, but if PGC membership becomes mandatory to hold quota, it could be used for unfair purposes. Please explain. PGC's Mission, Vision, and Values talk about serving and helping its members. You are now asking Canadians to give you a monopoly. That monopoly is obviously very valuable, or you wouldn't have spent over $150,000 trying to get it. What assurances do Canadians have that PGC will serve Canadians well? Shouldn't your Mission Statement recognize your duty to serve Canadians, rather than just yourselves? PGC's Mission talks about producing high quality pullets. Unfortunately, it makes no commitments about affordability, availability, on-time delivery, continuous improvement, understanding & serving the customer's needs, or risk. Why not, PGC? The PGC Vision speaks of communication, but what are you going to communicate: lies or the truth? Why not some commitment about openness, transparency, and accountability? In your roadshow slides, PGC talks about continual improvement in price efficiency. In the official documents (eg. By-laws, Mission Statement, etc. ), nothing on this could be found. Is this "bait & switch" marketing propaganda, or does PGC actually commit to these essential elements? PGC states that quality assurance and cost/benefit analysis will be considered down the road. Why shouldn't FPCC consider these as mandatory, with PGC having a proven track records in implementation prior to application for Part II acceptance? In the early documents and PGC's road show, you mention a cost to consumer of 0.25 cents per dozen for PGC to enter supply management, then it became 0.5 cents per dozen, and in the most recent answers provided to FPCC, you claim 2 cents per dozen. That's 800% cost inflation in 2 years, or 282% per year; clear evidence demonstrating that PGC understands how Supply Management works. How do we know that the acceptance of PGC's plan by those early supporters wasn't conditional on the 0.25 cents per dozen cost, and whether members/stakeholders of PGC would totally reject their proposal if they knew it was going to be a 2 cents per dozen hike in prices? Secondly, please explain the inconsistency in these prices. Are we to expect 282%/yr. price inflation from PGC from now on? PGC states that pullet quota will be owned by PGC, and once a farmer no longer raises quota, the quota is surrendered back to PGC at no cost. The exception is transfer to immediate family members or to shareholder in corporation, or an immediate family member of a shareholder. Can we not assume that farmers will incorporate, bring in a new shareholder, transfer the quota, and then cash out; thereby eliminating any quota that gets surrendered to PGC at no value? Please explain what you foresee here. PGC states that they want to participate in and protect Supply Management. Why is there no commitment from PGC that they will improve Supply Management for themselves and all Canadians? PGC notes that there are 550 pullet farmers in Canada, but had only 32 attend their AGM in 2009, 24 in 2010, 10 in 2011, and 18 in 2012; for a geometric average of 19. These numbers include the PGC Executive and Board Members. It appears that there are 19 or so committed members of PGC, which is just 3.45% of the total pullet growers. I also note that the Minutes of the PGC Board are secret, not to be shared with members. Please provide objective evidence that a majority of PGC members are truly supporting this group of 19 activists and their plans for Supply Management. BC and Saskatchewan are against PGC's plans, Alberta is doubtful. EFA is hesitant. PGC members in only 4 provinces have a majority of support for joining Supply Management. With 10 provinces and 3 territories, that is just 30.7% of the jurisdictions that support. By PGC's own figures, there is just 51.456% of the current pullet growers who support this plan. Why does PGC feel this is adequate to proceed at this time? The PGC Directors are indemnified for everything. I assume that this includes criminality such as fraud, bad faith, and negligence. All of these costs for a wayward director will eventually be paid by the Canadian consumer. Why is this blanket coverage necessary? During the PGC's roadshows, they were asked about the impact of this plan on small flockers. No answer was provided. Why was this relevant question not answered? Secondly, what is the full answer to this question? Similar to the previous question, there were a number of other questions that were asked, recorded in the minutes, but no answer was recorded. Will PGC supply answers to all of these unanswered questions before the end of the hearing? In one diagram in the PGC submission package, it shows the Hutterite communities as needing to be approached for input. Was this ever done? If yes, what was the outcome? If not done, why not? Will PGC be doing this prior to the end of these hearings? On numerous occasions and for assorted subjects, PGC has stated that they have nothing in place (ie. no policies, no plans, etc.) as of yet, but that once PGC is approved for Part II Supply Management, they intend to work on that issue. Isn't that counting your chickens before they hatch, or perhaps asking FPCC to buy a "pig in a poke"? With so many outstanding issues, there is a significant probability that one of these issues will not go as the stakeholders assume and expect. What makes PGC feel that this is an acceptable approach? Why not wait until PGC has worked out all of these issues, and then PGC can decide if they wish to re-submit their Part II application? PGC has stated that all pullet growers have been consistently and continually unable to recoup their true cost of production ("COP"), and this is the reason supply management must be sought and granted. Yet in their submission package, a group of pullet growers on the East Coast questioned the need for this proposal as things were going quite well and profitable. Evidence from Manitoba's pullet growers in the evidence currently before the Hearing Panel was of a similar nature. If PGC's assertions were true, we would expect a rising tide of churn in the industry (ie. people selling out after they lose hope of a reasonable income), or go bankrupt, or price wars, and similar artefacts. Have these occurred? Can PGC provide collaborative evidence to support its assertions on COP? No where in PGC's submissions is there clear support for considering allocation of production to the lowest marginal cost producers. PGC has repeatedly avoided answering this question, in spite of it being asked on many different occasions. How does PGC see that they will meet this statue-imposed requirement? In the Apr. 26/12 answers provided by PGC, PGC declares itself as 1st Receiver for pullet imports into Canada (ie. only PGC can import at the reduced duty of 6% or so, while all others would pay exorbitant duties, 300% or more). What does PGC feel are the pros and cons of this approach, other alternative considered, and how do you justify this as the best solution? For farmers who raise their own pullets (ie. closed loop), PGC proposes they would be exempt from supply management quota and levies. Is this an escape loophole available for all? What prevents a growing number of customers who are disillusioned with PGC from taking this approach? PGC provided a Risk Assessment in their filings. On reading the risk assessment, it was mainly directed at PGC's success with its Part II application. Little or nothing was done on the risks for the Canadian public, upstream suppliers, downstream customers, exporters, importers, or any other stakeholder groups. Why was PGC excluding all of these important stakeholders from consideration in their meager risk assessment? In PGC's draft Federal-Provincial Agreement, PGC proposes that pullet growers in non-SM provinces would have to charge the highest of two prices. Under some or most circumstances, this can result is all competitive advantage being lost by the best supplier, and artificial shelter provided for the worst suppliers. This seems to defeat the mandatory consideration of a balanced approach which considers the interests of the consumer. It also seems to defeat the preference for the best and lowest marginal cost producer. Please explain PGC's rationale for this pricing restriction. On numerous occasions, PGC stated that pullet growers in SM provinces can ship everywhere, but pullet growers in non-SM provinces cannot ship to SM provinces. That does not seem to be described anywhere in the official documents. Please explain where this is part of the formal system, rather than just rhetoric. Please describe the pros and cons of this approach, other options considered, and the justification for choosing this option. In PGC's submission package, it appears that PGC was encouraged to make a Part II application by one or more speeches by FPCC, which I assume refers to Mr. Laurant Pellerin, FPCC's Chairperson. If Mr. Pellerin has been actively encouraging Part II applications, how is FPCC supposed to make an objective, unbiased decision to recommend or reject PGC's application? Some might consider this encouragement to be similar to a criminal court judge advocating for drug dealers to step up their criminal activity so that the Judge and other courts have sufficient work and job security. Should Mr. Pellerin and all other FPCC personal who actively promoted Part II applications from PGC or others, recuse themselves from involvement in the PGC hearings and decision process? <Sarcasm_On>The Pullet Growers of Canada ("PGC") have figured out an ingenious way to help Canadians <Sarcasm_Off>. PGC (formally National Pullet Growers of Canada) must have figured that Canadians need to pay more for their food. PGC thought and thought about how they could get the pot of gold for themselves, while screwing Canadians at the same time. It's easy to do one or the other, but doing both simultaneously is the hard part. Fortunately for all of us, there are some really smart and dedicated people in the PGC. Their hard work paid off. They decided to apply to join the Supply Management Club. By becoming one of the Supply Management Mobsters, PGC will help screw Canadians out of another $11 Million per year to get eggs on Canadian dinner tables. There are more than 550 Million dozens of table eggs produced in Canada each year, and PGC's plan will increase the cost of production by at least $0.02 per dozen, resulting in a total cost to Canadian consumers of $11 Million. It was touch and go on this achievement for Canadians. When PGC started, they thought they'd only be able to achieve a price increase of just $0.0025 per dozen (ie. a quarter of a cent per dozen eggs). With further work and effort, they were able to get it up to a half cent per dozen, as promised during their Canada-wide roadshow to promote their joining the Supply Management Gangsters. Now that they have made an application to the Farm Products Council of Canada ("FPCC") for gangster monopoly rites, they have unveiled the whole story after repeated questions, avoidance & distraction. Fortunate for us, PGC was inspired to work even harder. PGC now feels, as disclosed in their filings that PGC can gouge Canadians even more. They have finally admitted that the price increase will likely be 2 cents per dozen eggs. I'm sure with time and much more efforts, and when they really learn how to make their Supply Management monopoly work, they will be able to achieve even higher costs than a 2 cents per dozen gouging of the Canadian consumer. How is the above any business of Small Flockers, and this Blog? For those who don't know what a pullet is, they are female chickens that are raised from day-old chicks to 19 week old layers. After attaining the ripe old age of 19 weeks, these pullets are sold to egg producers who use them to produce eggs for the next 52 weeks. At 1.4 years old (ie. 71 weeks old) the egg farmers consider these pullets to be "spent", as their egg production starts to taper off for the next 5 years, so the spent pullets get sold for slaughter, ending up as chicken soup, chicken pot pie, and similar fates. As a Small Flocker, we have the choice to: a) use our laying hens to brood some of our own eggs to hatching the natural way that Mother Nature intended; or b) take some of our layed eggs and put them in an incubators to artifically hatch our own next generation of layers, or c) buy day-old chicks from a hatchery, raising them until they start laying eggs that we can sell, or d) buy ready-to-lay pullets from a pullet grower. Buying just a few hens each year, Small Flockers pay a premium price to buy pullets; 5 times the price paid by the Big Boys with quota. This addition of pullets to the SM5 (ie. the 5 Supply Management Mobster Members: dairy, broiler chickens, table eggs, hatching eggs, and turkey) will probably hurt Small Flockers most of all. What should PGC be doing, in this Blog's mis-directed, delinquent opinion? They should focus on helping their members improve their COP (Cost of Production) and Quality. The above graph (from Page 26 of PGC's application files here) shows data of the 2007 pullet production year for 17 pullet producers in Quebec, 24 in Ontario, for a total of 41 farms. 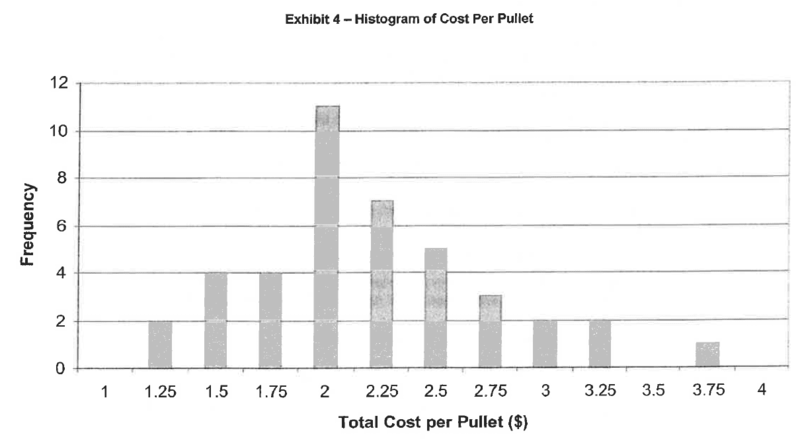 The average pullet price was found to be $2.103 per pullet, which is 168% greater than the lowest cost pullet producer. 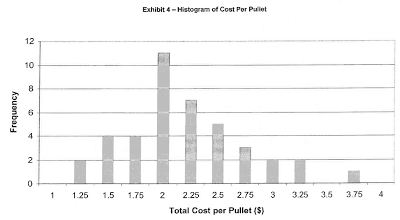 As can be seen, costs were as high as $3.75 per pullet for one producer, which is 3 times higher than the lowest cost pullet producer. Some of these cost differences were due to land costs, age of buildings & equipment, and other reasons that the farmer is somewhat stuck with, but many of the costs are controllable, or could be controllable. Most of the costs could be improved by communicating Best Practices amongst themselves. By working together and sharing ideas, everybody can become equal to the best producer. These are all the small tricks and techniques that add up to a fortune of savings. PGC doesn't need to be a Supply Management Mobster to do any of this; all they have to do is decide to be helpful, rather than a parasite. Those Best Practices would only be available for members of PGC. PGC could easily prove its value to its members every year. Everybody would want to join PGC, because it pays to do so. They could make more money, for both themselves and Canada, rather than screwing the public by becoming another Supply Management Mobster. Unfortunately, PGC decided to screw Canadians, rather than help Canadians. I wonder why?